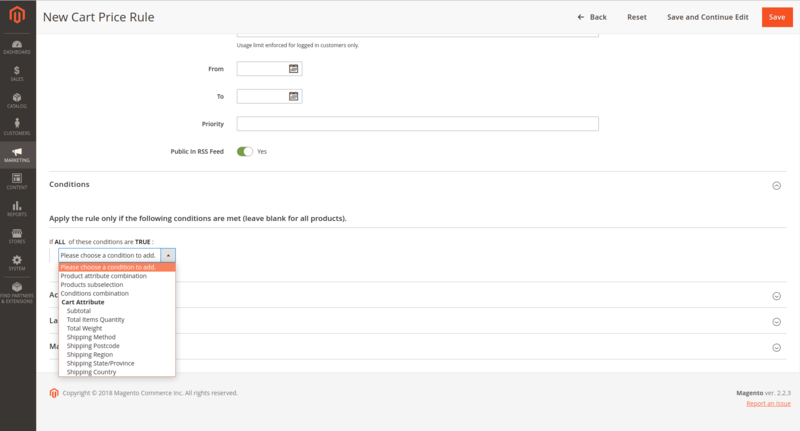 One of the features available by default in Magento is Sales Rule. The module is a powerful marketing tool that allows you to manage all types of discounts and promotions. You can find it in the Admin panel -> Marketing -> Cart Sales Rules. You can define many different options in which a given discount should be applied in the cart. If the cart value is greater than 50 – the discount should be applied. If this is a first order of a given client – the discount should be applied. Unfortunately, Magento doesn’t offer this option out-of-the-box – and this is where Magently comes to your rescue. In today’s article, we will focus on extending the available discount conditions. To understand how the available conditions are collected, you need to look into the Magento\SalesRule\Model\Rule\Condition\Combine class, more specifically into the getNewChildSelectOptions() method. You’ll notice that after the default conditions, the salesrule_rule_condition_combine event is dispatched and then the collected conditions are combined. * Get condition for customer first order. What happens in the observer? We’re fetching other conditions, for example the ones added in other observers, and merge them with ours. As you can see, one condition consists of a name and a value which means that it includes our class that will handle the condition. We load the Yesno model in the constructor of our logic that is mainly used as a source_model in the backend. We’ll fetch from it the available values for our select fields. Moreover, we load the factory of order collection that we will use for validating the condition correctness. We need to set the name and label of our condition in the loadAttributeOptions() method. getInputType() defines what will be displayed as an operator for comparing our attribute – the returned select field will allow us to choose “is” or “is not”. Returning a numeric value here would allow you to select available operators for comparing numbers, such as “greater than” or “less than”. getValueElementType() defines the type of the value with which we will compare our values. The returned select will render the field with available options, which we will define in getValueSelectOptions(). In case we don’t want to define imposed values, we can return text – an input with the option to write a given value will then be displayed (using numeric value and text would allow you to create a condition “if the number of customer’s orders is greater than X – apply the discount”). The last method is validate() that we use to check whether the customer has other orders placed with his account, and then we can set the value that will be compared with the one we previously defined. Now, we only need to create a discount with our condition and… voilà!